Turn pesky weeds into a delicious dandelion wine with a refreshing, light flavor. Dandelions are perceived by many as unwanted weeds, but this plant has been used for tea, herbs, food, medicine and even coffee! You've likely heard the expression "when life gives you lemons, make lemonade." How about dandelions? Make dandelion wine, of course. 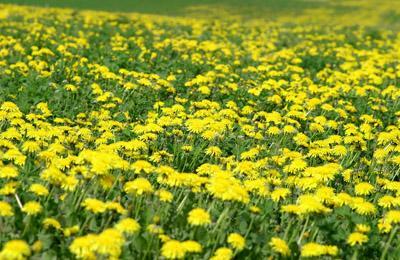 Select dandelions from an area that is free of pesticides. Pick dandelion flower tops during mid-morning when blossoms are wide open for the best flavor. Dandelions are at their peak in April or early May, although it may be later, depending on your climate. Dandelion wine is made only from the petals. Remove stalks and the green portion under the blossoms - both can ruin the wine's flavor. Wash dandelions well before making the wine. If you can't gather enough in one picking session, freeze the petals until you have accumulated enough to begin wine making. The citrus must be peeled very thinly, avoiding the white pith in the skins which will make a bad tasting wine. Boil the water, then pour over the flowers. Cover with a cloth and let the mixture stand for one to two days, stirring twice daily. Strain well. Add the remaining ingredients and let the mixture set for three weeks before bottling. Recipe makes one gallon. Recipes vary in their recommendations for aging - ranging from as few as two months, to as much as a year. The majority recommend that you wait six months before tasting the final product. Some of the wine recipes also ask for the petals to be placed in a nylon straining bag and tied, which is then placed in the boiling water. This eliminates the need to strain the dandelions from the water. Additionally, those preferring a dryer wine should use a half pound less sugar. You don't need special wine making supplies or ingredients to make your dandelion wine. Dandelions are abundant and available at no cost. The result is a refreshingly delicate wine that you are certain to enjoy. You can make a large enough batch to have plenty of wine on hand. Picking dandelions can be a fun activity that can involve the whole family! This light wine has a delicate flavor and can be paired with a number of different foods, depending on how you make it. If you don't include raisins, the wine is considerably lighter and well-suited for fish or salad. If you include raisins to enhance the body, the wine can be paired with pasta, poultry or fish. Dandelion wine may be served at room temperature, but for a truly refreshing beverage, nothing beats this wine served very cold.